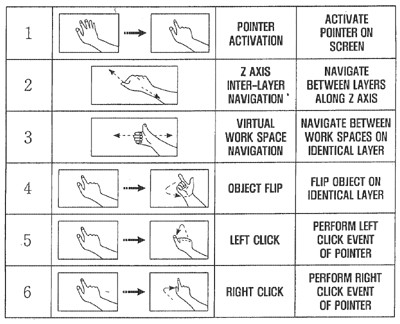 "Samsung's been getting pretty creative with cell cameras lately -- the Instinct lets you pan around web pages by tracking movement with the camera, for example -- but the company's latest patent application, for a gesture-based phone interface, might be a little less practical. The idea is to use the phone's camera to track your hand movements, which, from the drawings, should have you looking insane on the subway in no time. Of course, we've all been guilty of waving at and even talking to our devices when they're acting up, so maybe a little feedback wouldn't be a bad thing -- there's one gesture we'd definitely like to see programmed in there." This sounds kind of similar to the unconfirmed Windows Mobile 7 features and screenshots which were leaked back in January. Instead of using an accelerometer to detect motion based gestures, Samsung has decided to go the less expensive route of using our handsets built in camera. Sure it sounds silly when you say it out loud, and I am sure it will be even more silly to watch someone use it in real life, but it is still pretty neat technology. In theory this also makes it somewhat compatible with almost all of Samsung's handsets that are already on the market. Go team Samsung!